Obituary for Angeline Victoria (Hildebrandt) Ducker | Heubner Funeral Home Barry's Bay Ltd. It is with heavy hearts that we announce the passing of Angeline Victoria Ducker (Hildebrandt) at the age of 82 on Monday, April 15 at the Valley Manor Nursing Home in Barry’s Bay. Mostly known as Angela or “Bumbo” she was born and raised in Barry’s Bay by her parents Charles & Veronica (Cybulskie) Hildebrandt. She was a loving mother to daughter Liz, son Jamie & Bonnie, grandsons Xander & Skyler, son John & Martha, step-son Billy & Karen, sister twin-Adele known as Timmie, sister Joan & Rand, sister Vicki and brother Johnnie & Beth. She will also be missed by the Ducker family including her ex-husband William Ducker, her nieces, nephews, cousins and friends. Angela graduated from the Nursing program at Hotel Dieu in Kingston in 1957. 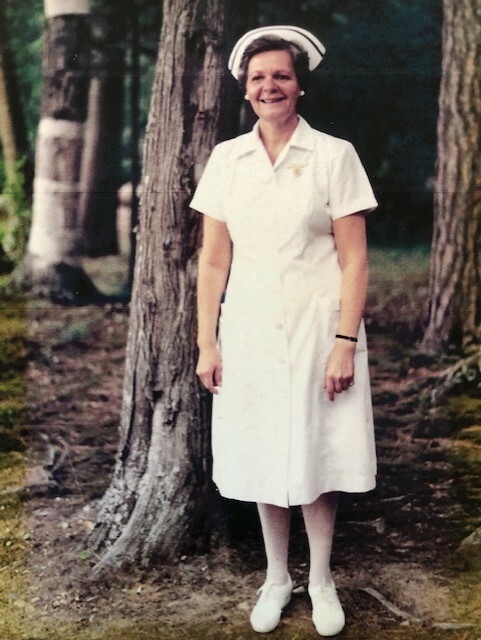 She started her nursing career in Toronto at St. Michael’s Hospital. She moved on to become Head Nurse at St. Francis Memorial Hospital in Barry’s Bay. She worked at Kawartha Quality Care in Peterborough. She spent the last years of her career at the Valley Manor Nursing Home in Barry’s Bay but a stroke forced her to retire in 1999. Angela spent her last year and final days at the Valley Manor where she touched the lives of both staff and residents. The Valley Manor had a special place in our mother’s heart and the family is grateful for the heartfelt care, respect and dignity she received in her final days. The family will be forever grateful to Dr. Dawes for the gentle compassion he demonstrated over the years that he cared for our mother. Angela was a fiercely independent, intelligent, loving, empathetic mother, sister, friend and nurse. Her door was always open to family and friends near and far for counsel with all of life’s ups and downs. She had a voracious appetite for reading, especially historical books and novels. Angela’s captivating presence, her sharp humour and her incisive wisdom will be sadly missed and lovingly remembered. There will be no formal service but a celebration of life at a later date. Donations in Angela’s memory may be made to the Valley Manor Building Fund.